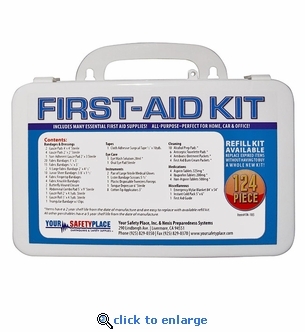 This premium 124-piece first aid kit makes an excellent kit for home, office, camping, car or RV. This kit contains many essential first aid supplies and is packaged in a hard plastic case with carry handle. Your supplies will stay fresh and dry with the moisture seal gasket lid. 15 Fabric Bandages ¾" x 3"
2 X-Large Fabric Bandage 2" x 4 ½"
10 Junior Sheer Bandages 3/8" x 1 ½"
1 Cloth Adhesive Surgical Tape ½" x 10yds. Lister Bandage Scissors 5 ½"
8 Cotton Tip Applicators 3"
Emergency Mylar Blanket 84" x 54"
Instant Cold Pack 5" x 6"